After 8pm at OR Tambo International Airport, waiting for the longest flight I have ever been on. Not sure what it will feel like to be in limbo for so long. Sure, I'll have stops along the way but the total journey will take two days. Didn't think I would get to New Zealand at all, so it's a long enough time to think about what I want to do when I get there. Can't come up with too many answers besides: to look around. A rugby journalist friend told me New Zealand looks like a chocolate box. Not sure if he meant appetising or neat or enticing, but I'll soon find out. First stop, Perth International Airport. Some will say it probably counts as a piece of South Africa, given how many have emigrated there in the last two decades. Buy papers, grab a yoghurt and muesli, and while away four hours. Wonder about South Africa's result in the third ODI. If they secure a clean sweep, surely the disaster in Dhaka last March will be well and truly buried. What about New Zealand? Will they recover to make a fist of the Tests? Finally, New Zealand. Almost don't get in at the arrivals desk. Am asked why I am visiting the country - even though South Africans can enter for three months without a visa - and say I will be covering the Test series. "Do you have any identification, like a press card?" the man at the desk asks me. Silently curse myself for never following through on that plan to get business cards. Rummage through my bag and wallet until something comes to mind. "Here's my card from the Zimbabwean Media Commission when I went there…" Before I can finish, I am waved past. Thank goodness for the press laws in Zimbabwe. Drive to Dunedin city past endless farms and see endless (this is not a joke) rows of grazing sheep. Get to the apartment too early to check in, so find a cute café to have a meal. Too confused to find out whether it's breakfast, lunch or supper. New Zealand Cricket has organised a 5pm press conference, which will help me stay awake until nightfall and beat the jetlag. Slept, refreshed and ready to go. Walk out of the hotel for a jog. Cold. Very cold. Johannesburg winter cold. Not sure I can feel my fingers or toes but remember commitments to stay healthy and fit and set out. So much to look at. Most interesting observation is the student homes. 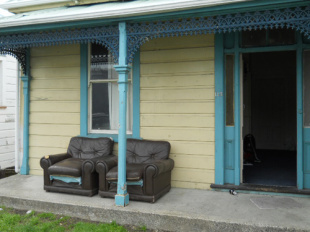 Discarded couches sit on every porch; most look weather-beaten. Why are they there? Also run past the University Oval, although I don't know it then. That couldn't possibly be the Test ground, I think. It looks like a field a club side would play on. Later that day, I discover I was wrong. See the South African team for the first time. AB de Villiers is the first to say hello. Find out from one of the New Zealand reporters that couches regularly get burnt in bonfires by the students, but nobody knows why. Have an interview with Nathan McCullum. Consider walking to Maori Hill but the hotel front desk tells me it's not a good idea. Watching the hills get steeper from the back of a taxi I can see why. Also remember that Dunedin is home to the steepest residential street in the world - Baldwin Street. Arrive at Café No.7, and not having got used to the prices yet, think it's one of the most expensive restaurants I've ever been in. Ask the hostess to please point McCullum my way when he arrives. She looks at me blankly and confesses she doesn't know who he is. Chatting to him later, I can see why stardom has escaped him. Plenty of evidence that he has learned to make the most of his talent and a sportsman's limited time frame in which to make a living. Match day. Another twist of South African-ness as the series opens with rain (the same has happened the last six seasons on the opening day of the South African summer). Play seems a long, long way away. The press box is a tiny, warm room that heats up like a sauna. From the outside it looks like one too, as the windows steam up. Lunch is moved early, eventually the ground dries, and the players get on the field at 2pm. Play ends at 7. A long day becomes even longer. New Zealand make it worth it. Few would have believed they could have South Africa on the ropes on a dead, flat pitch. Chris Martin does the damage with three wickets in four balls. Meet him at the press conference afterwards and am impressed by his careful and well thought-out answers. New Zealand undo all their good effort with the ball with an ordinary one with the bat. Vernon Philander's career continues as it started. He gets the same movement he promised he would produce "anywhere in the world." Spot Claire Taylor, former England international, who now lives in Dunedin, walking around the ground, and also serving drinks in the bar. A tight Test finally swings one way, South Africa's. Graeme Smith and Jacques Kallis both score centuries but the real news happens off the field. Kallis questions the legitimacy of ball-tracking. He speaks as though he is interested in going on about it for hours. It is the first time Kallis seems so alive in a media conference. He does not hold back as he talks about the "plenty" of issues the South African change room has with the accuracy of the system. He doesn't know it at the time but his comment that "99% of cricketers will tell you" that they believe ball-tracking is not as accurate as its made up to be will cause a big stink. It's the birthday of one from our party and we have something special planned - a trip across the road to the Forsyth Barr Stadium to watch a Superrugby match. It means a scramble to complete work by the 7:35pm kickoff, but we are up for it. On arrival, we are immediately thankful for the roof, because wind and rain lash the surrounds. This weather will last well into day five of the Test, but while we are watching the rugby we don't care. The Highlanders play an impressive running game to beat the Waratahs by one point. The match allows us to a see a slice of Dunedin life. It opens with a pipe band, an ode to the Scottish influence in the city - also seen in the architecture - and closes with a party in the student zone, the Zoo, which we were warned not to go into. Last night's rain has become this morning's pain as we walk into the ground under a heavy, hazy cloud. Even the diehards who were there on the first morning don't show up. The only person in the ground who is not working on the match is in an Australian from Sydney called Aimee, who has flown all the way to watch South Africa play. She waits outside the change room hoping to get the signature of every South African player and watches in amusement as we rush in and out of the press conference venue. A furore over the DRS has broken out, with Ian Taylor, founder of Virtual Eye, threatening to pull out. It gives us something to work on while we wait for the match to be called off. The Taylor story becomes bigger and we end up working well into the evening. The rain, like the work, does not stop. Eventually we head out with some of our New Zealand colleagues to a restaurant called Little India. One of the finest butter chickens in the world emerges from that kitchen. Pick-up time is 4:30am for an early flight to Hamilton that will go via Christchurch. Don't even get to say goodbye to Dunedin because morning light has not broken yet. The travel reminds me of some places in India - can't go from A to B without passing C-Z first. Christchurch airport looks fine a year after the earthquake. Hamilton's is a little like the one in Port Elizabeth, with a single carousel for baggage. Finally meet Kruger van Wyk, who I have been conversing with via email. His toughness and confidence are striking. The main street is a café culture connoisseur's delight. Settle into an Italian one for dinner and pick up the South African waitress' accent before she picks up ours. On realising we're compatriots, she jumps to an immediate conclusion. "It's safe here, hey?" she says. We nod. It's a common sentiment among South Africans who have emigrated. One wonders what will happen when they've all moved here. The town is so small you'll come across virtually everyone. Spot Gary Kirsten strolling past Starbucks, pushing baby Joanna in her pram. Spot Chris Martin and his wife walking down the road, also pushing a pram. Spot Martin Guptill and Doug Bracewell looking for somewhere to have a meal. Spot Imran Tahir's lovely wife Sumayya - the one he moved countries for - arriving in New Zealand. Spot the bar where Jesse Ryder reportedly broke team protocol by having a few drinks after the T20. Spot the gorgeous Seddon Park, with a white picket fence and rolling grass banks. Spot the tinges of green on the pitch and wonder if they will be there for the start of the second Test.